A withdrawn college kid who has envied metas his whole life has recently inherited powers. He applies for the only university for superheros in the world, hoping to be accepted, even if he only has had his abilities for a month, compared to those with years of experience. He quickly tangles himself up in more than he can chew, both inside and outside the university, and is forced to fight not only for the betterment of the world, but for his own survival. This is his story. This story updates on Mondays and Thursdays. Note- This is not a school-centric superhero story. Of Gods and Goddess has not been tagged yet. 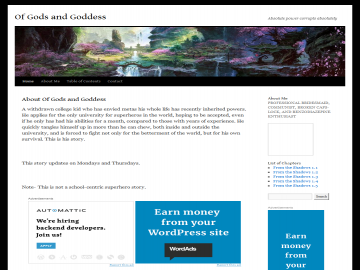 Help others find Of Gods and Goddess by tagging it! Of Gods and Goddess has not been reviewed yet. Of Gods and Goddess has not been recommended yet.